Ho Chi Minh City, widely referred to as Saigon, is Vietnam’s largest and busiest city. Packed with activity and home to a range of interesting sights, Saigon is Vietnam’s commercial centre and an exciting travel destination. Although Hanoi is Vietnam’s political capital, Saigon is the country’s commercial centre and largest city. Saigon’s increasingly dense skyline is a great indicator of Vietnam’s sustained economic growth throughout the late 20th and early 21st century. From war museums to beautiful colonial buildings, Saigon has a great selection of sights for travellers. Saigon’s great food scene and exciting nightlife make it an extremely fun city to visit and a great base for exploring the south of Vietnam. The commercial and administrative centre of Saigon, District 1 is where you’ll find most of the city’s top hotels and sights. Some of District 1’s attractions include the Reunification Palace, Saigon City Hall, Notre Dame Cathedral and the ultra-modern Bitexco Financial Tower. Thanks to its central location close to Saigon’s top attractions, hotels, restaurants and bars, you’ll probably want to stay in or close to District 1. Conveniently, this is also where you’ll find most of Saigon’s luxury and mid range hotels. Located inside District 1, Ben Thanh Market is a large indoor market that’s one of District 1’s top landmarks. Inside the market, you’ll find a great selection of goods for sale, from clothing to accessories, electronics, souvenirs, handicrafts and more. Be prepared to bargain if you’re interested in buying anything, as most prices are marked up by 100% or more. Note that there are occasionally reports of theft and pickpocketing in Ben Thanh Market — keep any valuables close to you to make sure you aren’t a target. As well as acting as a major landmark and convenient shopping market, Ben Thanh Market is a hub for Saigon’s bus network and will eventually act as an interchange station for the Ho Chi Minh City Metro. Known for its beautiful French colonial buildings, Dong Khoi Street is an important commercial street in District 1. The street’s architectural highlights include the Saigon Central Post Office, designed by Gustave Eiffel, and the Saigon Opera House. 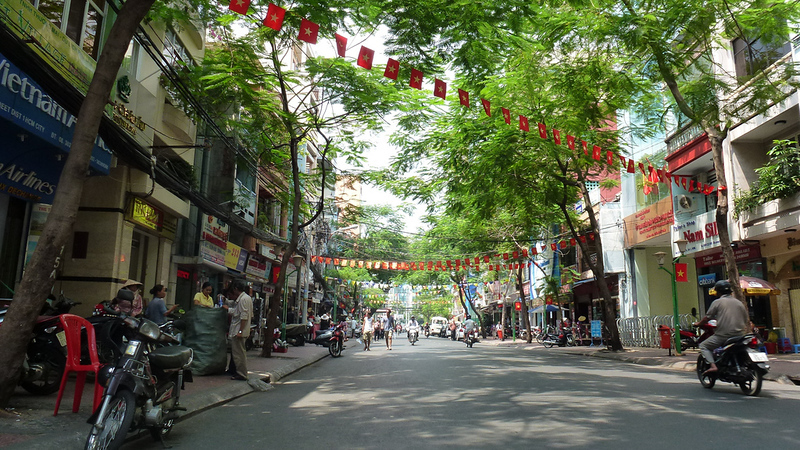 Another District 1 area, Pham Ngu Lao Street is Saigon’s backpacker hotspot. Much like Khao San Road in Bangkok, Pham Ngu Lao Street is well known for its cheap accommodation, bars and restaurants. If you’re visiting Saigon on a strict budget and want to be close to backpacker life, Pham Ngu Lao Street is the place to stay. District 1 is Saigon’s commercial and administrative centre — a relatively expensive, bustling and busy place to stay. District 3, on the other hand, is central and convenient but less busy than District 1. Home to several of Saigon’s best public parks, including the large and popular Tao Dan Park, District 3 is a popular area of Saigon for expats. 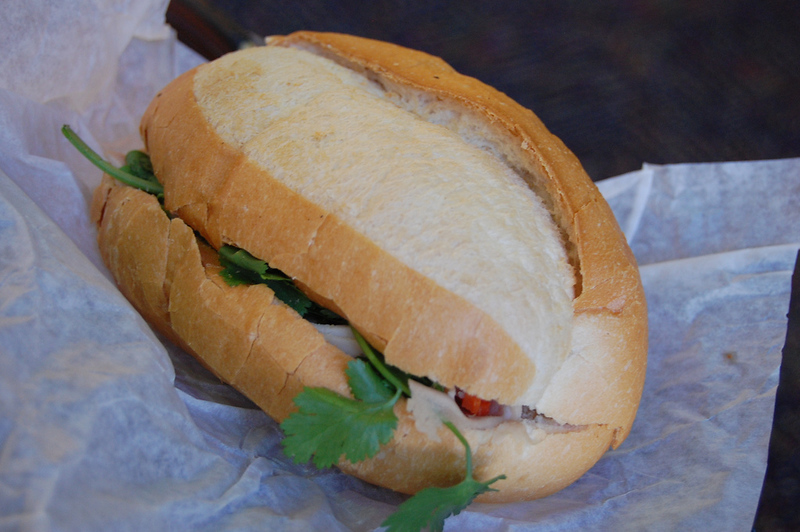 District 3 is home to some of Saigon’s best cafés, as well as the popular War Remnants Museum. Known for its large Chinese population, District 5 is home to Saigon’s largest market, some excellent restaurants and several Chinese-style temples and pagodas. Highlights include the Nghia An Hoi Quan Pagoda and Tam Son Hoi Quan Pagoda. Use the search box below to find out departure times and prices on your selected travel dates to Saigon. Although they’re almost always crowded with bus after bus of tourists, the Cu Chi Tunnels are definitely worth a visit. Located 40 kilometres from Saigon, the Cu Chi tunnels are a network of underground tunnels and passageways covering more than 250 kilometres in total. Built in the 1940s, the tunnels were massively expanded during the Vietnam War to allow the Viet Cong to launch attacks in South Vietnam. An estimated 10,000 people died in the tunnels during the Vietnam War, often because of heavy bombing raids. Today, the tunnels are partially open to the public. As well as the tunnels, which have been enlarged to allow tourists to enter, the complex contains examples of booby traps that were used in the war and a shooting range. Tours are available from travel agencies in Saigon. District 3’s War Remnants Museum offers an interesting look at the Vietnam War — known as the American War in Vietnam — and the earlier French occupation of Vietnam. A selection of war machines and vehicles, including a tank and fighter planes, are on display. Note that many of the museum’s photographs are quite graphic and disturbing. The museum also makes no effort to be unbiased in its coverage of the war — expect a detailed but highly one-sided look at the wars Vietnam has fought throughout its history. The Museum of Vietnamese History covers tens of thousands of years of Vietnamese history, from prehistoric civilisations to the country’s colonisation by China, the Champa period and a range of other eras. Also known as the Independence Palace, the Reunification Palace was the site of the final skirmishes of the Vietnam War. Today, the Reunification Palace is open as a museum and acts as an interesting time capsule back to 1960s Vietnam. One of several great examples of French colonial architecture in Saigon, the Saigon Opera House was built in 1897. Today, the Opera House hosts a variety of performances such as the A O Show — a contemporary circus performance covering Vietnamese culture. The 262.5 metre ultra-modern Bitexco Financial Tower dominates Saigon’s skyline, visible from almost anywhere in the city. Located on the 49th floor of the tower, the Saigon Skydeck offers great views of the city and its surroundings. 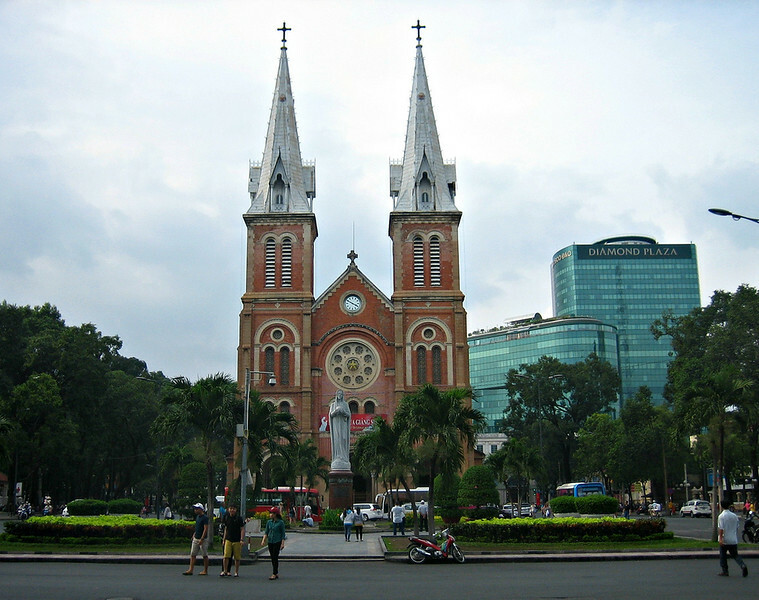 Built between 1863 and 1880 during the French colonisation of Vietnam, District 1’s Notre Dame Cathedral is one of Saigon’s most well known landmarks. Notre Dame Square, the area around the cathedral, is a beautiful if somewhat busy place to stop for a photo. Located in District 11, Dam Sen Water Park is an excellent escape from the heat, hustle and bustle of Saigon. The park includes a great selection of water slides, a rope swing, massage pool, wave pool and rafting course. Located close to Notre Dame Cathedral in District 1, Intercontinental Asiana Saigon Hotel is a luxurious and modern five-star hotel. A great selection of rooms and suites are available along with an outdoor pool, spa and health club. Sleek and modern, Hotel Nikko Saigon is one of several five-star hotels in Saigon’s District 1 area. Hotel Nikko offers a selection of modern rooms and suites, stylish lounges for business travellers and an outdoor swimming pool and spa. Open since 1959, the Caravelle Saigon Hotel served as an international communications hub during the Vietnam War. Today, it’s a cosy and comfortable five-star hotel located close to the interesting sights and attractions in District 1. With spacious apartments and a rooftop bar and restaurant, Emm Hotel Saigon is one of the best three-star hotel choices in Saigon. Located in District 1, Emm Hotel Saigon is just a few kilometres from Saigon’s top historical and cultural attractions. Clean, modern and spacious rooms make Paradise Saigon Boutique Hotel a convenient hotel close to Ben Thanh Market. A selection of comfortable rooms and suites are available, all of which are equipped with free Wi-Fi. Lan Lan 1 Hotel offers comfortable, clean and tastefully decorated rooms in walking distance of Ben Thanh Market. Although the hotel’s facilities are basic, its great location and spacious rooms, all of which include free Wi-Fi, make it a convenient choice. Clean, cosy and tastefully decorated, Town House 23 Saigon Hotel offers a good selection of rooms for budget travellers. Set back from the main road, its quiet but convenient location is just a few minutes away from Ben Thanh Market and Saigon’s backpacker hub. Located close to Pham Ngu Lao Street, Lily Hostel offers a mix of private rooms and hostel dorm beds at great prices. Rooms are clean and quiet, making Lily Hostel a great option for sound sleep in one of Saigon’s busiest areas. Another Pham Ngu Lao Street option, Bich Duyen Hotel offers a great location close to some of Saigon’s most popular backpacker bars and restaurants. 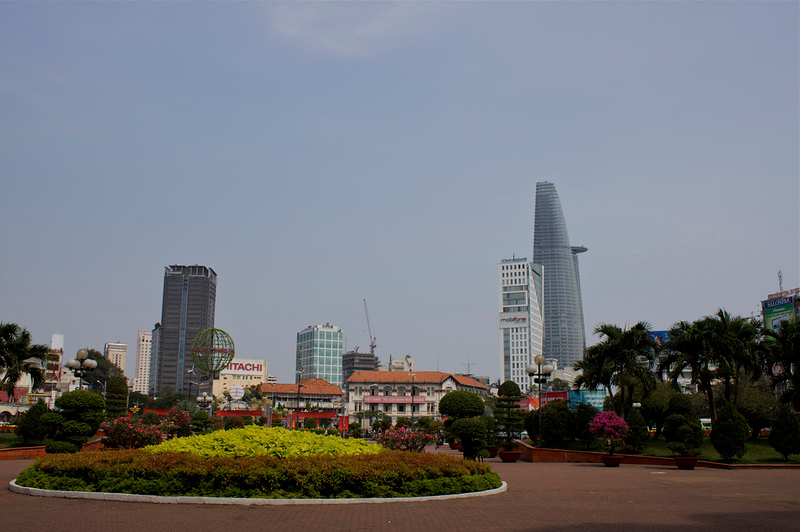 Most of Saigon’s top attractions are accessible within a 15 to 20 minute walk from the hotel. Located in the garden and ground floor of a beautiful French colonial villa, La Villa serves a modern French menu with an excellent selection of desserts. Another high-end French restaurant, Trois Gourmands is set inside a beautiful villa, complete with a large swimming pool. Despite the high-end food, pricing is extremely reasonable. Saffron serves tasty Mediterranean food in a convenient location. Reservations recommended as the restaurant can be crowded in the evening. Located inside District 1, Ichiban Sushi Vietnam serves high quality fresh sushi. A wide range of Japanese and American-style sushi dishes are available. Hidden inside Pham Ngu Lao — Saigon’s backpacker hotspot — Baba’s Kitchen serves great Indian food at reasonable prices. Although Saigon might not be known for pizza, Pizza 4P’s does an excellent job cooking up high quality authentic Italian pizzas in its brick oven. One of several great cafés in District 1, Cafe If serves excellent coffee, tasty Vietnamese food and great fruit smoothies in a central location. Beautiful decorating, a fantastic ambiance and excellent Vietnamese food have all made Cuc Gach Quan a favourite of expats in Saigon. Centrally located in District 1, Quan Bui serves excellent Vietnamese food and cold beer in a stylish and charming setting. Although it’s located in District 5 and a bit of a detour from most of Saigon’s tourist attractions, Pho Le is worth a visit for anyone interested in tasting authentic Vietnamese pho. Tan Son Nhat International Airport, Vietnam’s largest and busiest airport, serves the Saigon area. Flights to Saigon are available from Bangkok, Singapore, Kuala Lumpur, Manila and a wide range of other Southeast Asian cities. There are frequent domestic flights from Hanoi, Da Nang, Hai Phong and other major cities in Vietnam to Saigon. Long haul international flights are available from Paris, Moscow, Istanbul, Abu Dhabi and other destinations. Check Skyscanner to compare airlines for the best prices and flight times to Saigon. Trains to Saigon travel south down the Reunification Line from Hanoi. Travellers on the way to Saigon by train will arrive at Saigon Train Station, which is a five-minute taxi ride from the city’s major accommodation areas in District 1. 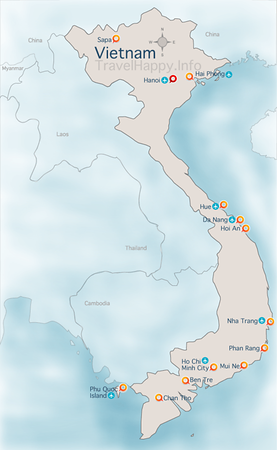 Although travelling by train is an inexpensive way to get around Vietnam, the country’s long, thin shape and generally low quality rail infrastructure means that journeys can be extremely slow. It takes approximately 30 hours to travel from Hanoi to Saigon by train. There are several bus stations in Saigon and a wide range of bus operators offering transport to and from the city. Buses depart from Da Nang, Hoi An, Nha Trang and other popular cities several times daily. Buses to Saigon are also available from Phnom Penh. Note that visas are not available at the land border between Vietnam and Cambodia. If you’re travelling from Cambodia by bus, make sure you have already received a Vietnam visa from the embassy in Phnom Penh before you depart.